Last night I explored patch 6 and all it's glory. First off, I went through each of my toons and purchased my reagents tab. 100g well spent. My oldest characters gained the least. Elkagorasa gained about 3 open bag slots. Haven't made any alchemy recipies in quite some time, so bags fairly empty of herbs. Eride had a bunch of tailoring mats, but not a lot. She's been working on the cloth healer pants. Alliance druid gained almost 2 whole bags free of skinning / leatherworking mats. Next, Elk went to the void storage and moved all his old gear into the new storage slot. A few more runs back and for to the bank would really help, but not last night. I had a world to save. Queue up for the new UBRS dungeon. 45 minute wait as DPS. Oh well, moving on. Trip to the barber to get a new 'face'. Yeah, face. Ok, now looking at the before/after screens I am not sure it's that different, but the preconfigured options are only slightly different from each other. I liked the 'toughness' from this face (he's constantly scowling) vs the placid "town idiot" look of the old one. Now, run down into the Drag and grab the portal to Blasted Lands. From here I picked up the quests and started running through them. At my time (approximately midnight PST) there was only 3-4 people running these quests. The kill # of something quests were easy, but there was a little competition. Scouts posted around the starting area were limited. There were only a few executioner, but they respawned quickly. I got 2 just standing still. The mini-bosses were all mass-kill so my dps helped those lower dps toons. I liked the changes to the mini-map dealing with questing. Blue zones (like before) for quest item "kill/get x of these" and yellow dots inside blue zones for items that I had to interact with. Overall, way too easy with i540 gear and the legendary cloak (tuned for i500 gear I believe). All the quest rewards were in the 500s. My druid will have to work at this. In the middle of the quest chain, UBRS popped. The revamp streamlined the entire dungeon. The eggs have all been cleared out and new boss encounters all along the way. If you are raid-aware, you shouldn't have any issues with any of these bosses. We had one DPS who kept dying. (I didn't check his gear or stats). It appeared to all be 'personal loot', so I never rolled on items. I got it or I didn't. For example, I picked up a new chest piece.. Maybe swap out my tier chest with this and equip my tier shoulders that I just picked up a month ago. AMR suggest Best in Bag..
A number of add-on's failed, most noticeably my all-in-one bag. Blizzard actually added two pop-ups telling me that I had outdated "interface additions". Will need to force curse updates each time I logon. Overall, I enjoyed the changes. No negative fallout from the stat squish. My chaos bolt dropped from ~500k damage to around ~40k damage. It's still impressive, but more manageable. I was still two shotting most trash (that's leading with immolate, then conflagrate). I do miss casting a curse to lead with, but that will pass (changes button bar order). Looking at my armory page, I do need to re-glyph, as two of them disappeared. What has really surprised me is the grief Blizzard is getting for this (i.e. "stat squish", skills lost, PVP is now dead, healing is hard, etc. ). (Trying to find comment where player complained about how all his gear is now Wrath levels!?!? and the gold he lost due to buying gear on AH that are no longer useful!) Hasn't the PTR been available for at least a month now? Hasn't every WoW news source been talking about every one of these aspects since last Spring if not Blizzcon? What's your first impression? Do you like where the game is going? I'm looking at a live stream from HeelvsBabyface. He was using a iLevel 567 affliction and basically blow through heroic fireland and dragon soul. I guess that's what I'm doing it later tonight. I send 4 toons through Fireland 10N on Wednesday, and was blowing through the place. On Thursday, after they hotfix it, it was significantly harder, and I only had time to send in 2 toons (I was tanking SoO10 Heroic). 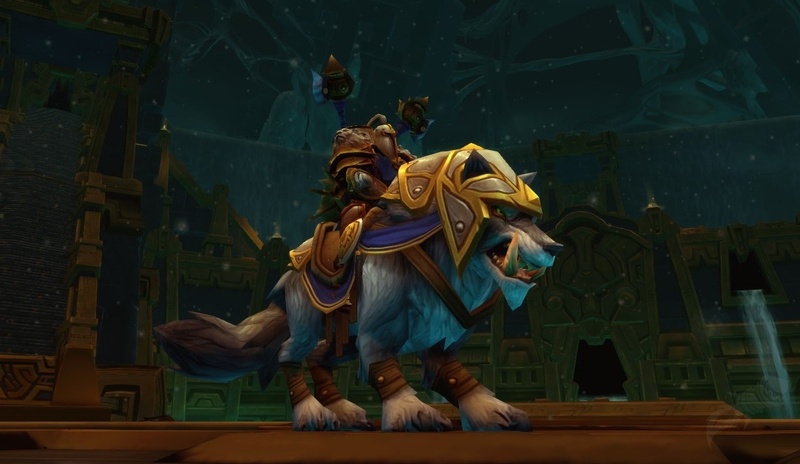 The good news is that I got Rag's mount, so I'm happy.